"A great way to use up all those extra fresh tomatoes and zucchini from the garden during late summer. My family loves this soup! If you like, this soup can be thinned with a little bit of milk or cream." In a large colander, sprinkle salt over zucchini slices. Let stand 30 minutes to drain then pat dry. In a stockpot, heat vegetable oil over medium high heat. Sautee zucchini onion and garlic in the hot oil for about 10 minutes or until onions are translucent. Stir in the chicken broth and tomato; simmer for 20 minutes. Remove the vegetables from the broth using a slotted spoon and puree them in a blender or food processor. Return the pureed vegetables to the stockpot and stir in the lemon juice, sugar, oregano, basil, parsley and nutmeg. Season with Worcestershire sauce, hot pepper sauce and salt and pepper to taste. Simmer for an additional 5 minutes. i used two cans of seasoned diced tomatoes and added a little more hot sauce. delicious! I made this exactly as the recipe said and it was really good. 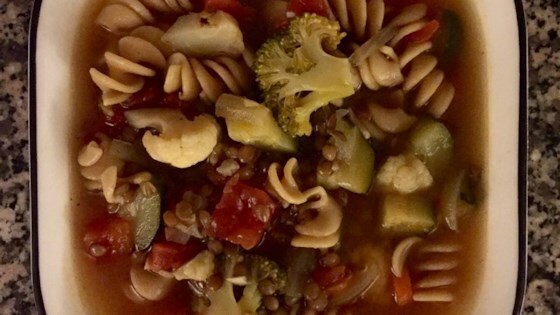 My husband does not like tomatoes or zucchini and really liked this soup.